When it is really hot out, I find that I enjoy small snacks in place of large meals. Grazing on nuts, fruits and cheeses with a cool drink in hand is a relaxing way to spend a humid evening. Hummus is a delicious (and quick) addition to any lazy dinner or appetizer spread, and these easy embellishments on the standard chickpea fare will add flavor and and a splash of color. Add all ingredients to a food processor and pulse until smooth. Serve on pita or crostini and garnish with a basil leaf for color. Add the peas, ricotta, olive oil, and salt to a food processor and pulse until smooth. Stir in the remaining ingredients. 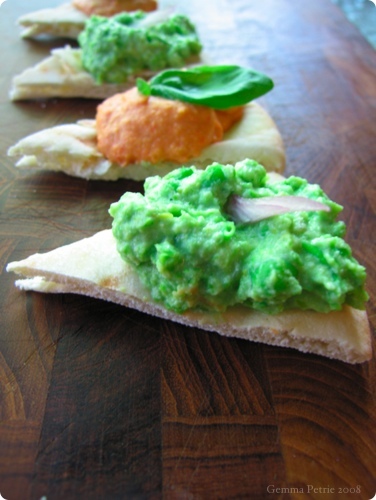 Serve on pita or crostini and garnish with a shallot sliver for color.